This is going to trip you out. I discovered this by accident while doing a "super zoom" into some high res Fukushima photos from a drone flyby in March 2011. 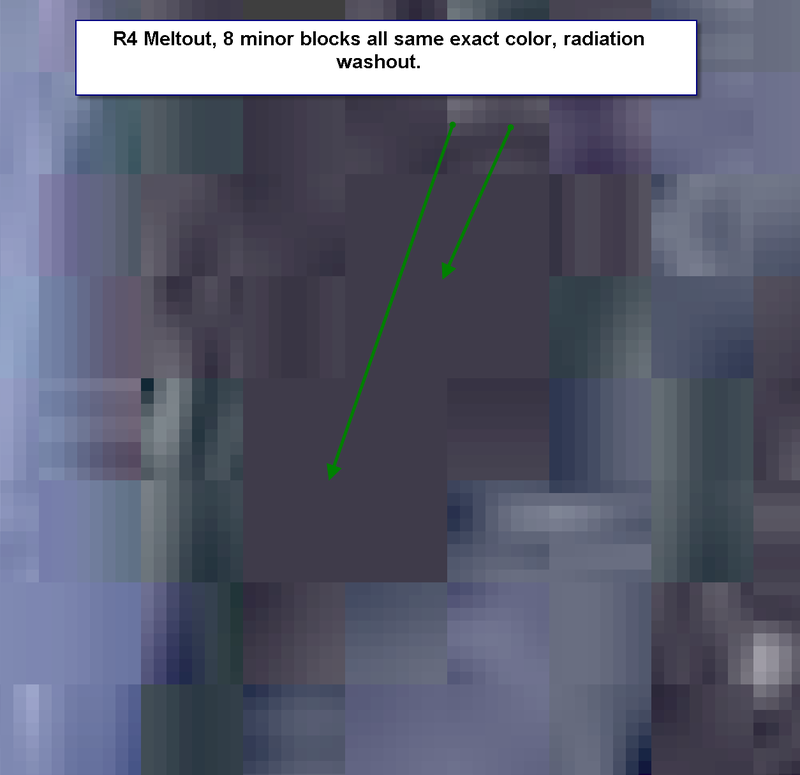 Areas of exposed high radiation (melt out or blow out) show as a set of 36 pixels being all the same color in a Mini Block. They are never all the same color, except when the radiation flashes them and the camera can only react by "printing" a single color. Very interesting. When the same "source" has the same effect on different picture shot at different times and from completely different angles, you just have to say hmmmmm. Also confirms a meltout from Reactor 4. Look at all these and let me know what you think. Here is a video from that site on Reactor 4 Melt Out. This is important. 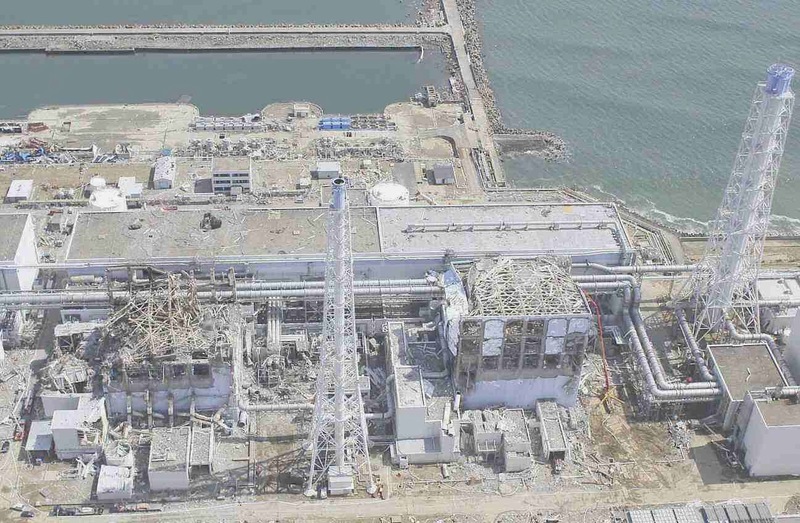 AGR and myself both independently came to the conclusion that TEPCO was also experimenting with MOX in Reactor 4. They were not licensed to, and MOX is way more dangerous. However, the pro-nukers have MOX as their main sales tool to "get rid of existing nuclear waste" and to soup up the old clunker plants using the MOX to extract profits and keep their "precious" industry alive. 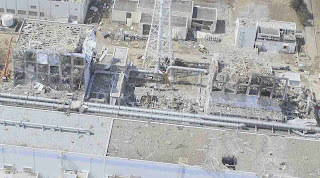 Admitting that MOX is EXTREMELY dangerous, and caused a mini nuclear explosion at Reactor 3, AND admitting that the new MOX in the equipment pool at reactor 4 melted out due to its increase reactivity and therefore heat and radiation....well that would shoot their MOX down, and it would shoot their source of their high faluting livliehood down. And they can't have that, even if the face of ocean killing diasasters. So they cover up and lie. 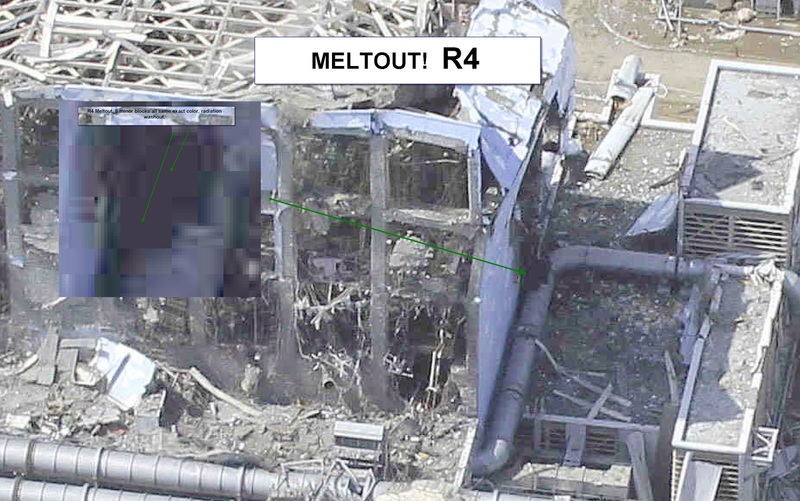 At Reactor 4, the new MOX they were loading (ready to load in the equipment pool) melted down and out. And when corium contacts cement, it pretty much immediately releases all its cesium and start making 10 fold the normal amount of strontium. 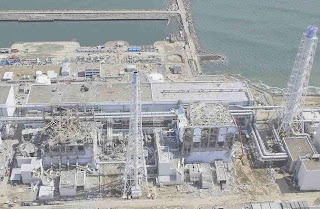 At Reactor 4, spent fuel pool, there was a 9 hours fire, and certainly a lot of poison was released, but that stopped with borated water. But not the MOX fuel, that burned through the stainless steel liner, and 3 feet of concrete. MOX-GATE you heard it here first. 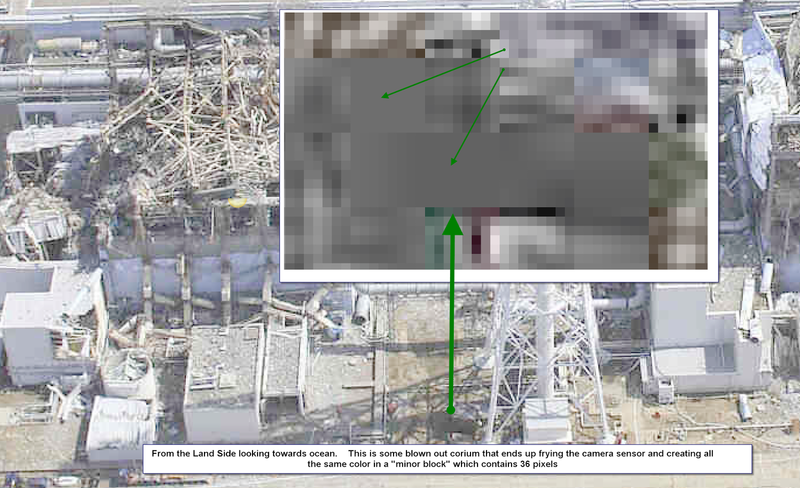 My tin-foil hat money is on intentional obfuscation of something in the drone images, similar to redacted words or lines in text documents. Right, I did an extensive research on ionizing radiation effect on digital cameras and came up nearly empty handed. Your link was the best of all that I found, however the testing the amateur did was only to elicit visible light while looking at the chip in the presence of a source (radar detector). The CHS guy who answered him was pretty good though! However, I don't think that test for "sparkles of light" is really proposing the same thing as my accidentally discovered "saturation leveling effect"
I wasn't willing to go down the conspiracy rabbit hole, but I sure can! LOL. I just don't think that in the midst of that emergency they were smart enough, not busy enough, to be redacting pixels on flybys. It is a very strange effect, of course found by accident. After applying a gamma filter, and using an image browser Thumbsplus to super zoom (you aren't going to get that zoom on a browser. I haven't checked other Image viewers but others should also work. Someone give it a try? Stock out. Sent your link to our photo forensics guru on facebook group 311 Fulushima Watchdogs. Normally in digital photography a CCD or CMOS sensor only sets adjacent pixels at identical values at the two ends of the luminosity spectrum, full black, rgb 0,0,0, or full white, rgb 255,255,255. But these 36pixel blocks are taking a mid-gray value, rgb n,n,n, where n is approximately the average value of neighboring pixel blocks. In technical terms, color saturation is zero, and luminosity is not zero and not 255. There is 1) significance in the n value being identical between R, G, and B (zero saturation), and then there is 2) significance in the n not being 0 or 255. 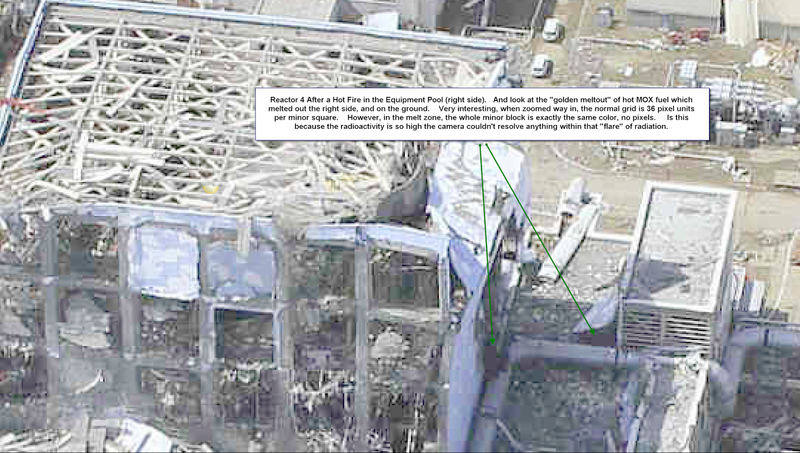 Clearly the sensor is not behaving as designed, which argues that the sensor is being exposed to something not encountered in its design and testing. My educated guess: Intense gamma (photon) radiation is overloading some part of the sensor electronics, only at the pixels being discussed above. The macro luminosity of the 36 pixel block is being set correctly, but the luminosity variance within the block is being overloaded and is defaulting to zero variance. 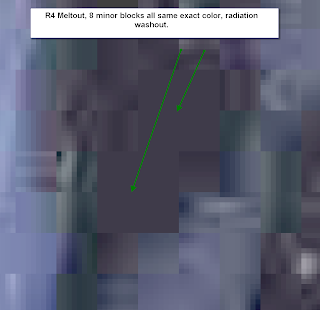 Because of this overload, as a cascading error, the 36 pixel block also reports zero color saturation. A different brand of camera would probably behave differently. Are you in the camera industry? This sure is interesting stuff. No, I am just an engineer (BSME). Did you check to see if there is any EXIF data (such as camera brand) on the original images as provided by TEPCO? These were from a fly-over company. 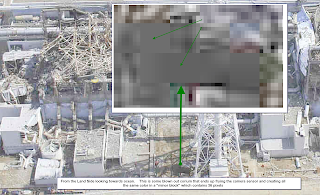 I searched for your images within the Cryptome Eyeball Series, and found the high resolution aerial-2011-3-30-1-11-12.jpg inside daiichi-photos.zip, which I found on daiichi-photos.htm. This photo displays the monotone 6x6 pixel miniblock phenomenon you describe above. But unfortunately there is no EXIF data. A small percentage of other high res photos from zip files at cryptome do have some EXIF data. Camera manufacturer was not given. 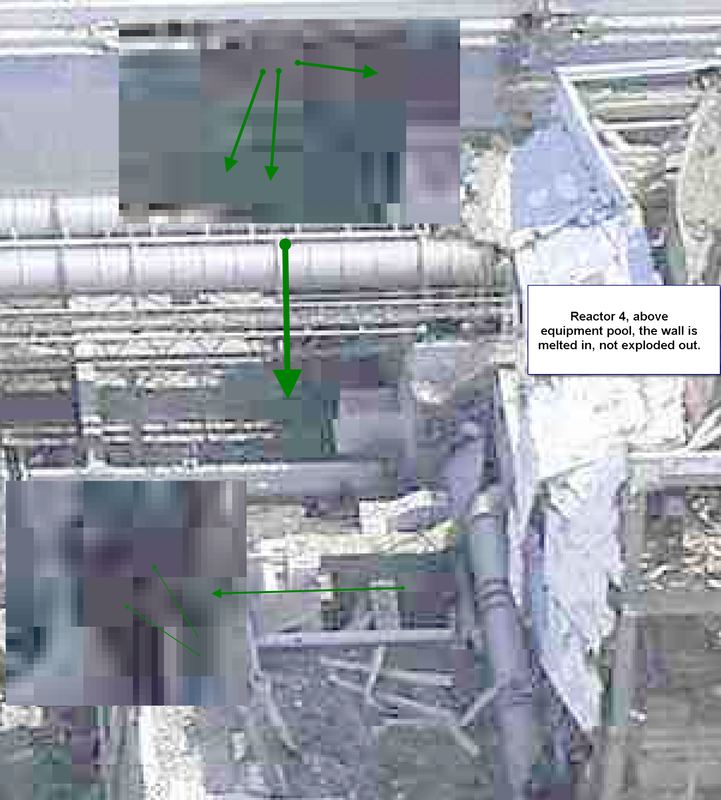 TEPCO had in 2 cases provided an image title, and in one case image software was identified as Photoshop. 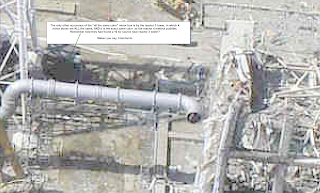 The image referenced in the first paragraph displays the monotone uniblock phenomenon in places where radioactive condensation would drip from the duct at the bottom of the melt-out area. So I'd say your theory remains plausible. Zombo, thanks for doing the extra research, and an independent look at the photo data. Stay in touch. Now let's work on detecting neutrons with a digital camera... We need both! Where is Waldo the corium? I think they have a very good idea where the coriums are, just that they feel the truth is too much for people to bear, and the truth would prevent the restart of their "precious". An employee used to work drilling and fracking until he saw the light and went into solar. He says their ability to image underground is insanely good, up to 1 mile. They know where the coriums are. There already is a Gamma Cam. Sometimes used in medical imaging. With a camera lense you focus the light on the CCD sensor which creates a sharp image. Radiation would not be focussed onto the CCD sensor just as light would do. To use a camera for radiation measures (if the CCD is sensitive for it) you could only do generaIized measurements. The CCD works quite similar to a Geiger counter, it multiplies the original signal by evoking chain reactions leader to a bigger signal. At least that is what I remember from science classes. 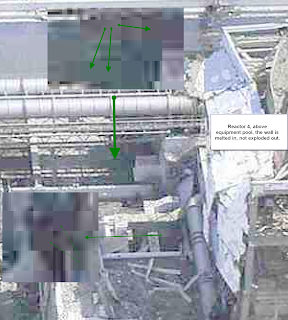 I meant that radiation cannot be focussed on a specific set of pixels on the sensors. If there would be radiation it would be scattered all over the picture, like the footage from Tchernobyl. Maybe it is some artefact from sharpening or other calculations. I don't know how they create the high resolution picture. My guess would be that they combine multiple images into one and create some sort of superresolution. Prone to artefacts. I don't think so. I mean, when talking high resolution, its still only 4MB, I shoot that all day long with my Canon Rebel. Only the most direct view of the radiation sets off the saturation levelizing effect, just like headlight, it is very bright if you are the deer directly in its path. However, it becomes far less bright being slightly off angle.